Please Note: The invoice scheduler is not compatible with proposals containing services with multiple tax rates and proposal values with decimal places. Tax will be divided across all services, and may result in irregularities with calculation in these cases. Practice Ignition does not recommend using this feature in proposals with multiple tax rates. This feature is being depreciated and will be retired before the end of 2019 in favour of a more flexible billing engine for building your proposals. If you already have this feature enabled, you can continue to use it, but we will be releasing updates well ahead of this features retirement to allow you to transition your proposal process going forward. The Invoice Schedule allows you to create a custom payment plan for your clients. You can determine the amounts to be invoiced each month for a proposal. Enabling Invoice Schedule will also hide the individual prices for each service within a proposal, just showing the total cost of the proposal. This can only be used for Fixed Price proposals, not Variable Priced proposals. If the proposal has services that are billed on a monthly recurring basis, they must have pro-rata enabled. Using the Invoice Schedule also means that account codes cannot be applied per-service in invoices. You can include services to be Billed on Completion but they will be un-editable in the invoice schedule. To use the invoice schedule, first create your draft proposal as per usual and save it. From the Invoices & Payments tab, you can then click Schedule Invoices. You will get a slider from the right-hand side where you can switch it on or off. Simply hit Enable Invoice Schedule to get started. This will then show you how your invoices are currently scheduled to go out. You will notice that any amount to be billed on completion is displayed at the bottom and is un-editable. Split upfront 50% upfront on acceptance and 50% at the end: This will split the upfront amount and make half of it due upfront, and half at the end. This will only apply to any amounts that are scheduled as upfront, but can be edited. Distribute upfront across engagement: This will evenly split the upfront amount across every month in the engagement period. Quarterly payments: This will distribute all upfront and monthly payments into quarterly amounts. Reset to default: This will return each invoice amount to the original settings before the invoice schedule was switched on. When you have finished editing the schedule, click the Save Schedule button. 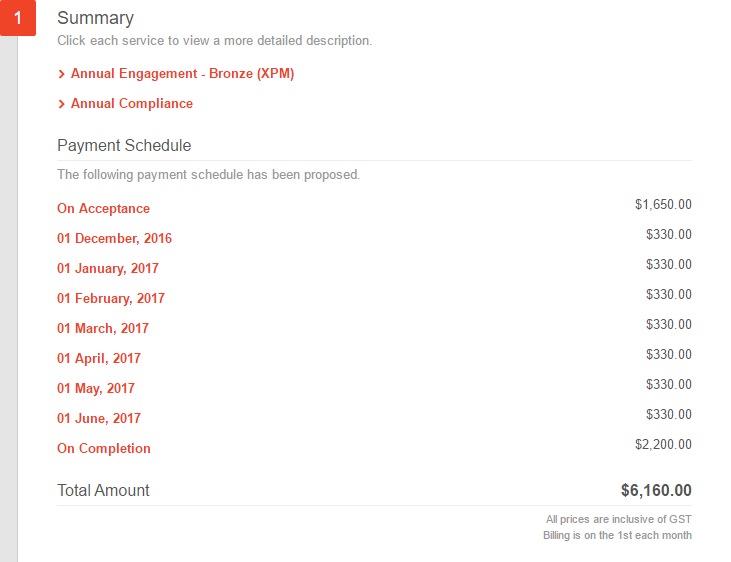 Part of the features of the Invoice Schedule is that it shows a 'Service Summary' and 'Payment Schedule' without the individual service prices, instead of the normal pricing summary in the Letter of Engagement. On the client acceptance page, we also hide the individual service prices. However, service prices are displayed to advisors(users) in the app. From here, send or review and queue your proposal as per normal. 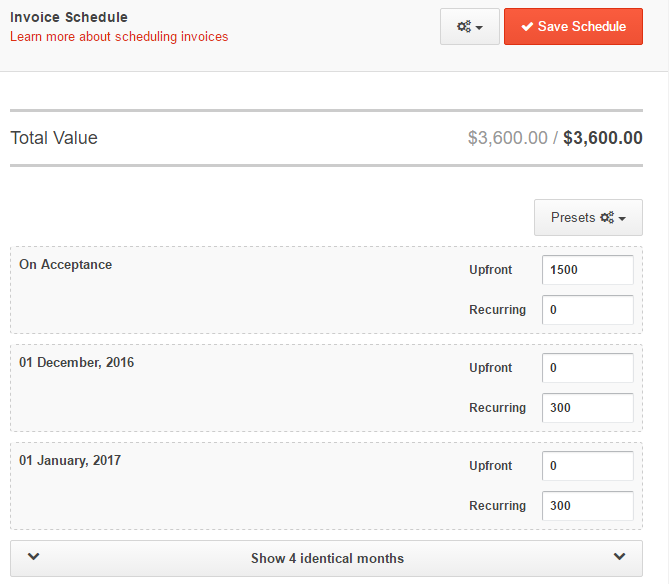 After acceptance, you can click on the Invoice Schedule. You can click on the 'Scheduled' tab to view and edit what is still in the plan to be invoiced and the 'Invoiced' tab to view what had been invoiced. If the proposal was accepted after the start date of the proposal, the previous months amounts will be added to the upfront amount as pro-rata. If you edit the service offering after the proposal has been accepted, you will be prompted that your existing proposal will be cancelled. You will then create a new proposal that will need to be accepted. Why are is there an upfront and a recurring box for each month? 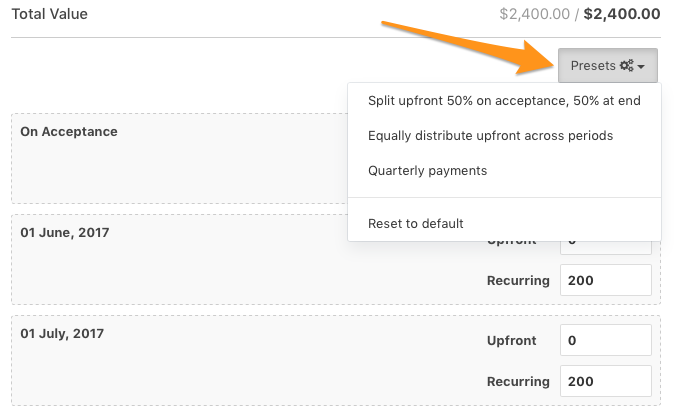 We take the billing types that were selected when the proposal was created, and split them up in the invoice schedule so that if you choose a default option such as 'distribute upfront across the engagement, we know which amount to apply that rule to. When the invoice is created, we combine the amounts in the two boxes and make one line item. 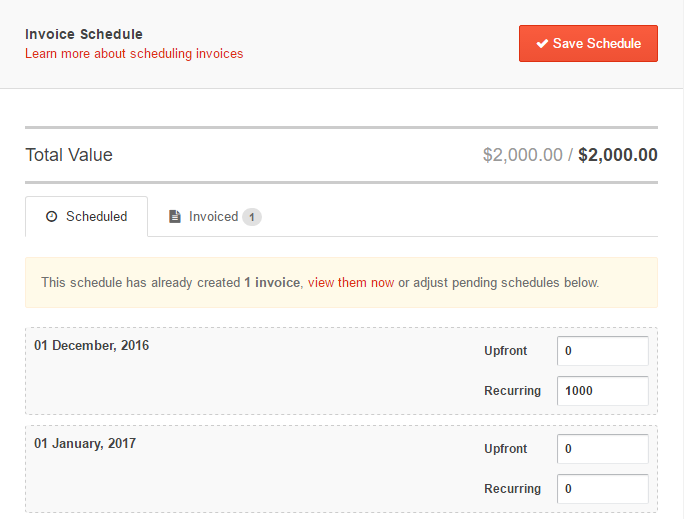 Can I have the payment schedule view without using the Invoice Schedule? Not this view is only available when you use the invoice schedule. I edited the proposal and now it says the scheduled total doesn't match the invoice total. 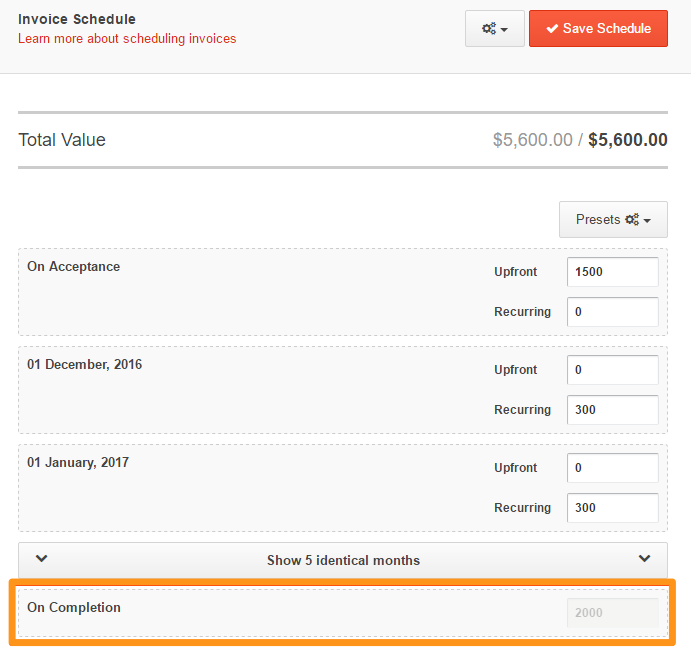 If you change service prices or add/remove services to a proposal after you've enabled the invoice schedule, you will need to reset the invoice schedule by clicking into the invoice schedule, then turning the toggle at the top off, closing the slider, then turning it back on again. Why can't I edit the 'On Completion' amount? On Completion services are invoiced manually through the Invoice Client button. The reason is that On Completion services are invoiced depending on when users actually finish work for their clients. If you wish to bill your clients once the engagement is complete, you can set this amount on the last recurring billing date of your proposal. If you are having problems with the rounding, please contact us at [email protected].